The Congress has expanded from a one-day gathering in 1969 to the present five-day event. The past forty+ years have seen a tremendous growth in the enthusiasm for our instrument as evidenced by the many gifted young artists who have performed at the Congresses. Congresses have been held in the United States, Canada, France, England, Germany, Japan, Italy, Spain, Slovenia, Thailand and Scotland. Perhaps the most important aspect of these gatherings is the spirit of camaraderie present at each Congress. The performances have often been brilliant and the music remarkable, but for many an equally important aspect of these meetings is the opportunity to meet with old friends and to make new ones. The willingness of colleagues to discuss their experiences and share their insights has made each Congress extraordinary. The 18th World Saxophone Congress will be hosted in 2018 by Dragan Sremec in Zagreb Croatia. 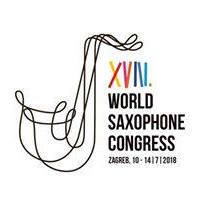 As one of the world’s largest gathering of professional, amateur, and student saxophonists, WSC XVIII will feature a full schedule of concerts and presentations and will include displays of instruments, music, and accessories by manufacturers and retailers from many countries.